AUSTRIAMICROSYSTEMS, represented by Adilam Electronics , has expanded its display driver portfolio by introducing the AS1120, a new RoHS compliant LCD driver which supports alphanumeric and bar graph displays. Targeted at industrial and automation markets, the chip can drive up to 46 segments of non-multiplexed LCD displays and can be cascaded to increase this number. The serial interface allows for an easy integration into microprocessor based solutions with minimal interface between the display and data source. The AS1120 achieves ultra low current consumption of 5µA given austriamicrosystems' expertise in low power design. 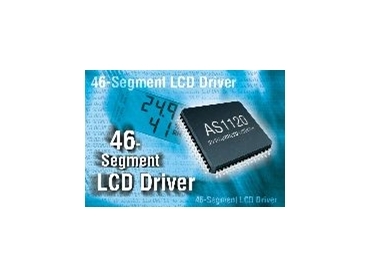 In addition, the AS1120 display driver offers unmatched brightness stability over a wide temperature range. Power supply input ranges from 3V to 5.5V. Individual segment control enables custom display applications for a wide variety of needs. Applications examples include: gas stations display, process monitoring and equipment displays as well as instrumentation readouts, digital clocks, thermometers and others. The AS1120 is available in a 64-pin PQFP package.